The McLeod Stereotactic Radiosurgery Program includes from left to right: Dr. T. Rhett Spencer, Radiation Oncologist; Dr. William Naso, Neurosurgeon; Dr. Larry Grubb, Radiation Oncologist; Tobin Hyman, Chief Medical Physicist; Dr. Virginia Clyburn-Ipock, Radiation Oncologist; and Lisa Esco, Medical Physicist. SRS and SABR also benefit a patient’s time with fewer treatments. Compared to conventional radiation therapy which involves smaller daily doses of radiation in 25 to 35 treatments over five to seven weeks, SRS/SABR delivers five to ten times the daily dose of radiation in as few as five days of treatment. The increased dose improves the effectiveness of this form of treatment. When the team uses radiotherapy to treat tumors in areas of the body other than the brain and spine (lung, liver, adrenal gland, prostate); it is referred to as stereotactic ablative radiotherapy. These two forms of treatment, performed at McLeod, function differently from conventional radiation in that the intent involves delivering an ablative dose to overwhelm all of the abilities of a cancer cell to defend itself. 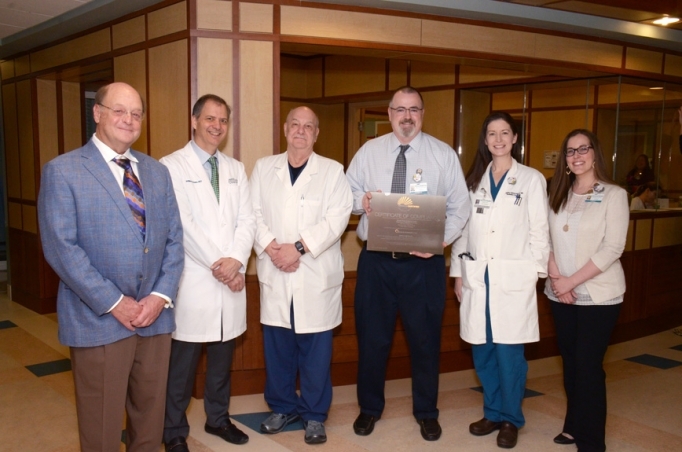 In addition to this certification, McLeod Radiation Oncology has been accredited by the American College of Radiology – Radiation Oncology Practice Accreditation program (ACR ROPA) since 2013. Of the roughly 2,500 radiation centers in the United States only 710 of those or 26 percent are accredited by the American College of Radiology.